Having a used bike adds a world of convenience to your life. Be it driving around the city traffic or going for an outdoor trip, a bike is a must-have vehicle for every household. If you are opting for a pre-owned bike, you will be happy to know that you can opt for bank financing to buy a used bike. Some of the top banks and leading financial institutions have come forward with loan offers for motorcycles. Since you will have a lot of options to choose from, it is good to first keep in mind a few key pointers that will make it easy for you to procure a loan for a used bike. Loan financing is a function of risk that the banks take for lending you money. For this, they check your CIBIL score to verify your credibility. Getting a historical perspective into the timeliness of loan repayments in the past is a good indicator that you will be disciplined in your approach in the future also. Hence good credit score will translate to better ease of obtaining a used bike loan. When you are opting for a loan, keep in mind that you will have to repay it. Ask questions and clear your doubts if you aren’t quite sure of the interest rate, EMI, tenure etc. Are you planning to take credit card loans? Steer clear of doing that as it will lead to severe repayment loads. Consumers can get direct loans where repayment depends on your credit profiles and reports. Some of the known manufacturers offer exclusive financing options on their vehicles. You can avail of these offers and repayments will be determined according to your limits. You can also apply for a personal loan if you offer a mortgage to loan providers. That is another way of getting financial support for your pre-owned bike. Analyze the available choices and then decide what to do. No matter what you choose, the prime emphasis is always on optimizing your satisfaction and minimizing risks. Perfect communication and proper understanding between buyers and lenders is important. You have to look for reliable lenders who have years of experience in this sector. Just like lenders are in search of credible borrowers, a vehicle buyer should also build associations with reputed lenders. They will have predetermined rules, clauses, and terms which are explained quite clearly. Every lender has distinctive terms and conditions. However, basic offers remain the same. You need to know what they are offering for your chosen model. 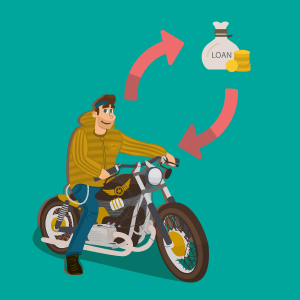 Financing options for one two-wheeler may not match with the other, which is the reason why you should be aware of credit offers and loan options. Transparency is the name of the game in getting finance for used bikes. You or your lender shouldn’t be in darkness when it comes to knowing credit history, repayment capability, interest rates, repayment clauses, or time limits. With these handy pointers, it will be fairly simple to get a loan for a used bike.